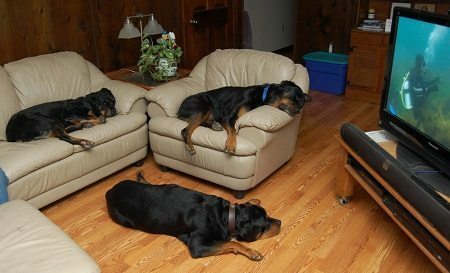 So, your Rottweiler’s favorite seat in the house happens to also be yours. Can you blame them? Why do we like to sit on the furniture? Because it’s comfortable, right? Would you lay on the floor given the opportunity to sit on your comfortable couch or easy chair? No! What makes us think our dogs are going to feel any differently? Then how, if our furniture is so comfortable and inviting, do we keep our dog from jumping onto it whenever they feel like being comfy too? How do you handle them jumping in our chairs when we catch them? Let’s look at the facts and figure out how to keep them off the couch. Your dog wants to lay on the couch because it’s cozy. They also want to lay in your favorite chair because it smells like you. It is a comfort to them to be laying where you sit. This does not make it ok for them to do so. You need to create a place for them to call their own. A place where they can feel warm and cozy. There needs to be an area in your home or in each of the rooms your dog has exposure to that is designated for their comfort where they can feel safe. Your furniture is so inviting because it’s comfortable, so make sure you have a blanket or a pillow they can call their own to lay on and be happy and comfortable. Keeping a blanket or pillow in each room your dog has access to can help prevent the desire to get on the furniture. Your favorite seats are a tempting place for your Rottweiler to seek out because it smells like you. If your dog is experiencing separation anxiety, it may be a silly thing to do, but if you leave an old pair of your socks or an old shirt in their bed, they can have your smell in their special area, and this may relieve their anxiety, and make their bed seem more enticing. If you expect your Rottweiler to understand that they are not allowed on the furniture, it is important to always discourage this behavior. Do not allow them on the couch one day and then scold them the next day for laying on the couch without your permission. If you want to keep them down, you cannot allow them up there at all. As mentioned previously, it is essential to have an area where your dog can call it’s own, where they can feel warm, comfortable, and safe. Your Rottweiler may like a particular piece of furniture for reasons other than just simply because it’s comfy. There may be a window they like to look out behind your couch. It may be inconvenient to you, but sometimes doing a little rearranging can fix this dilemma. If your Rottweiler is notorious for getting on the couch which happens to be next to the door and under the window with the best view of the front of their territory, you may need to find a new place to put your couch to keep them off. The way your dog is going to look at it is, well, the couch is in front of the best view of the front of the house! And from here I can see who is coming by my door! So, it’s best to just surrender that area if possible. They can’t jump on the couch that is in front of the window if said couch is not there. They also may feel more powerful up on the furniture. This can cause very bad behavior issues if you continue to allow this. If your Rottweiler begins showing signs of aggression when on the furniture, you may need to limit or possibly even ban them from that room. If your dog is trying to prove their dominance by using the furniture, this behavior must be halted immediately. Your dog may also be getting on top of your furniture because, well, monkey see, monkey do. Especially if you have a cat! They see the cat on the table, why can’t they get on the table? So frustrating! But keep calm. Remember to always keep calm! And when you catch your Rottweiler on the furniture….. When you find your Rottweiler on your furniture, it is important to keep your cool, but also discourage this behavior. Rottweilers are a large breed dog, they can grow upwards of 110 pounds! So when you inevitably find them on the couch or in your favorite chair, you must tell them “no” and remove them safely. First, give them the opportunity to get up and jump down on their own. No need to scream and yell. This may cause your dog to become fearful, and you do not want them relieving themselves on your furniture because they are scared. Just tell them “no” or “off” in a firm voice, and if they do not move on their own, then firmly push them to encourage them to move, or firmly grasp their scruff, which is the skin on the back of their neck, and gently pull them to encourage them to move. If they are wearing a collar, you can just grasp the collar firmly and lead them down onto the ground. And lead them right to their bed and praise them. It is important that you do not throw them off or shove them hard so they fall off the furniture. You do not want to unintentionally injure them! Rottweilers are prone to having hip and shoulder problems due to their size, so please be gentle with your gentle giant. When you have successfully removed them from the furniture, it is also important to direct them towards their comfort area. This could be their blanket, bed, or crate. Someplace they can call their own. When they lay down in their area, give them verbal praise so they know this is where they are supposed to lay down. They will learn that getting up on the furniture does not get them praise, but laying in their bed will. 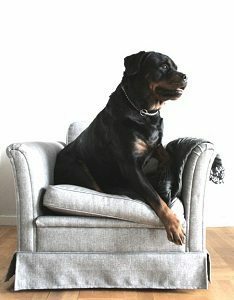 Make sure you have a special area just for your Rottweiler where they can feel warm, safe, and comfortable. Give them lots of praise when they get off the furniture and lay in their beds. Be cautious and kind when removing your Rottweiler from the furniture, and keep your cool. Do not allow your Rottweiler on the furniture for any reason unless you want to continue allowing them access to your furniture. 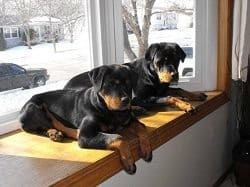 You may need to do some rearranging to keep your Rottweiler off the furniture that is in front of windows, especially ones outlooking your dog’s favorite focal points. This story is full of great information. You certainly understand Rotties. I your suggestions for working with such a big dog.